One late August weekend, we just happened to wake up really early and made it to the nearby orchard before anyone else, including the 95 degree heat. We then spent the day making peach ice cream, and slicing peaches to freeze for later use. I started with a bourbon peach pie mix that included brown sugar, cinnamon and bourbon for caramel flavors. But to experiment, I also made a zingy peach pie mix. The zingy peach mix had more herbs and citrus. I added ground ginger, fresh ginger and the tiniest amount of rosemary. This fall, my F3, my friends and I started making our way through the Tarantino films. 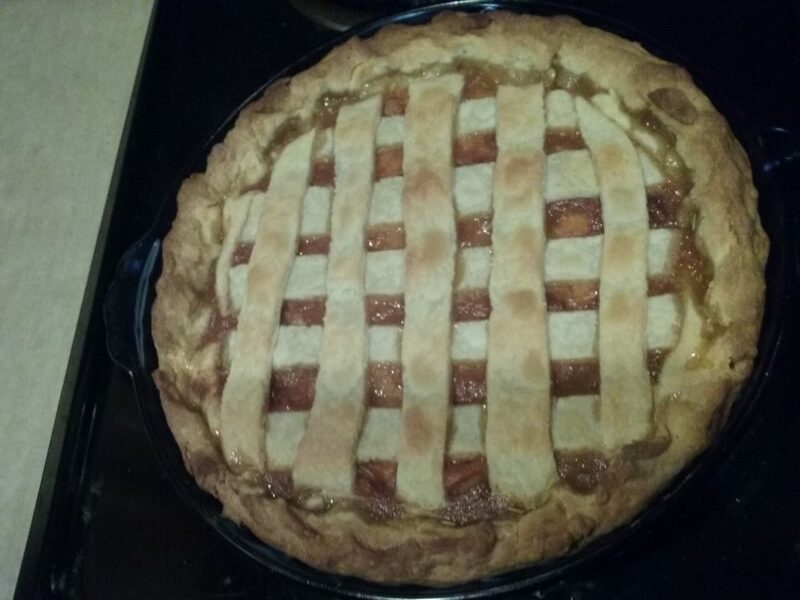 I pulled out the zingy peach pie mix as we started with “Jackie Brown.” I think I could have added more rosemary and much more fresh ginger, but because I was experimenting, I was a little cautious. I also should have remembered to add the lemon juice to brighten the flavor after the pie filling had defrosted. My F3 made a faux lattice topping for the pie with my pie crust recipe. Doesn’t it look beautiful? I encourage people to make pie fillings ahead of time because you can preserve a dessert for a later time. Just don’t forget to add the lemon juice before you set it in the pie crust!